Photo: The Tent of Casually Observed Phenologies creates a space for visitors to contemplate climate change. It can be hard to face a future we fear. Divination has been used by cultures throughout the world to help people navigate difficult futures. 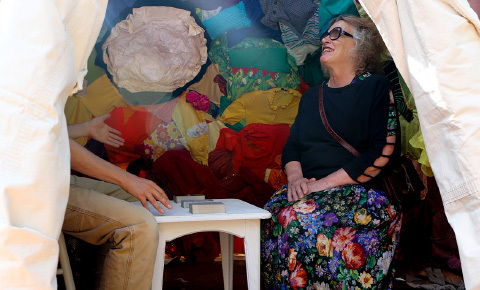 Artist James Leonard has adapted Tarot cards to help others process what he calls “overwhelming climate anxiety.” This summer he’s traveling the country, making one-day stops to give climate change divinatory readings inside a special, hand-sewn tent. At each stop, Leonard spends the day inside his tent, offering free, private climate change readings. Everyone is invited. Readings last approximately 15 minutes each and are given on a first-come, first-served basis. Leonard calls his artwork The Tent of Casually Observed Phenologies. From the outside, the tent looks like a cross between a post-apocalyptic wigwam and a children’s blanket fort. The rainbow interior is made out of brightly colored recycled clothing. It required over 500 hours of hand sewing to complete. Detailed tea-colored ink paintings of different plant and animal species—each reportedly affected by climate change—are pinned to the outside. James Leonard is an internationally exhibited artist. He recently finished a 2016 artist residency at MASS MoCA. In 2015, he was artist-in-residence at the Boston Center for the Arts. When not on the road, he lives and works in Brooklyn, NY. See more about James, the project, and its traveling schedule here.